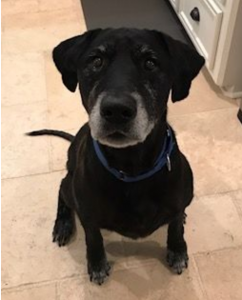 9/29/2017 – Bo is in a foster to adopt situation – congrats Bo! Bo survived Hurricane Harvey but in the process lost his family. After losing everything in the flood, they could no longer care for a senior dog like Bo. Bo returned to his Canadian roots (he is a Labradour after all) and came to Canada on September 11th. He’s looking for a foster to adopt situation as we tend to any medical need he might have in the interim. Primary issue being that is he Heart worm Positive. A common and non-contagious parasite, he will need to have daily pills and period shots over the months until the parasite is gone. During that time Bo gets to be Bo, and just needs to rest! He lived with 5 large dogs in Houston when he was in foster there, and does well so long as proper introductions are made. Due to lack of history we’re looking for a home without cats or kids.